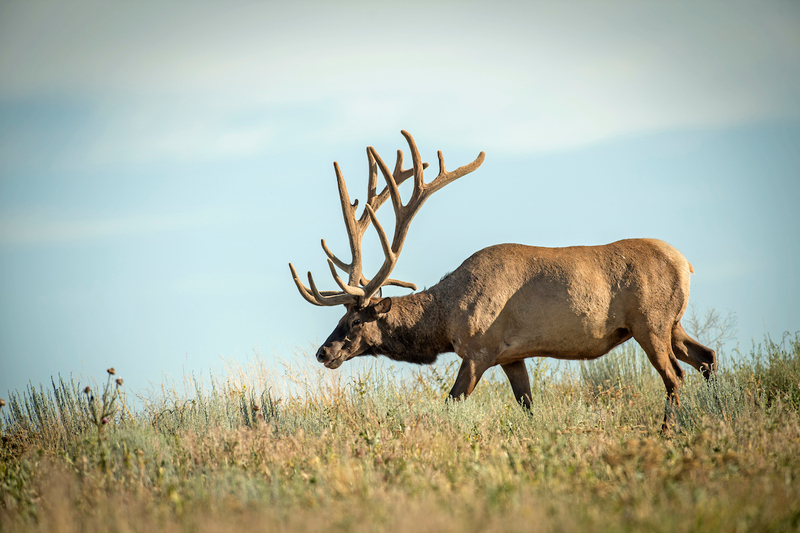 If you’re an elk hunter or plan to eventually hunt the great wapiti, here are some elk basics that cover the animal’s origins, body language and the rut. If you're looking for elk facts that are rooted in animal biology, like how many chambers an elk's stomach has, how much elk typically weigh or what they like to eat, check out our Top 10 Elk Facts. This elk installment explores basic facts too, but it's focused more on elk behavior and the elk's impact on heritage and culture. We also offer additional outside resources that are rich with information on this big-game animal. Q. First, a practical item: which of the six elk subspecies are extinct? There are six subspecies. They’re listed below. The two extinct subspecies are Merriam’s (once located in the Southwest and Mexico) and the Eastern subspecies (their home range was east of the Mississippi). Q. What messages do elk send via body language? Alarm. When alarmed, elk raise their heads high, open their eyes wide, move stiffly and rotate their ears to listen. Reaction to a wandering cow. If a harem cow wanders, a bull stretches his neck out low, tips up his nose, tilts his antlers back and circles her. Aggression. Elk threaten each other by curling back their upper lip, grinding their teeth and hissing softly. Agitation. Agitated elk hold their heads high, lay their ears back and flare their nostrils, and sometimes even punch with their front hooves. Why are elk sometimes referred to as “wapiti”? “Wapiti” is a variation of the Native American word “waapiti.” A Shawnee and Cree word, it means “white rump.” This answer might lead to a follow-up question which is this: do elk indeed have a white rump? If you take a look at this diagram published by Kentucky Department of Fish and Wildlife Resources, you’ll see that there is a light beige “rump patch” on the backsides of all elk, which contrast fairly sharply with the animal’s darker legs and neck. The image shows elk in their winter body coloration. What’s the elk’s origin story? North American fossil records suggest ancient relatives of elk first appeared in early Miocene, which is a geological epoch that ranges from 23 to 5 million years ago. There were ice ages in the Miocene time frame, if that helps you put your finger on where this period falls in time. How do bull elk attract cows during the rut? Bulls wallow in mud to coat themselves with urine “perfume” to attract cows. They also bugle and rub trees, shrubs and the ground with their antlers to attract cows and intimidate other bulls. A couple of other thing that are interesting: Bulls gather cows and calves into small groups called harems, and they aggressively guard their harems against other bulls. On occasion, bulls will battle over harems and sometimes these battles end in death. Why do artists paint elk? Honest writing requires truth and this is not a question most would ask. But the answer lends itself to a handful of interesting facts about our culture and how essential hunting and wildlife are to humanity's story. Plus, the question offers a segue into a fun video of wildlife artist Ryan Kirby as he makes a massive, bull elk come to life. Artist paint wildlife as a form of communication, recordings of hunt, animal sightings and adventures. According to Mall Galleries based in the United Kingdom, ancient wildlife paintings and drawings, “were full of understanding of the living animal, brilliantly simplified and direct." Some of the oldest ancient art of wild animals may have been recorded 164,000 years ago in South Africa. But that’s uncertain because it was the pigment, not the art itself, that was discovered. According to the Smithsonian, the pigment, which is known as ocher, could have been used for painting or mosquito repellent. Other art on the island of Sulawesi in Indonesia may be older still. Behind these “potentials,” the oldest dated art is found in the Chauvet Cave in Southeastern France. It’s commonly considered to be between 30,000 and 32,000 years old. Today, we’re centuries removed from artists who once relied on pigment ocher, but modern hunters like Ryan Kirby on Boone, North Carolina are still painting wildlife, including this elk.